Powers/Abilities: Argyle Fist is a brilliant tactical commander. History: Little is known about the background of Argyle Fist. ((New) Defenders I#144 (fb)) - Argyle Fist knew Candy Southern when she was only a baby. The extent of his relationship with her family is unknown. 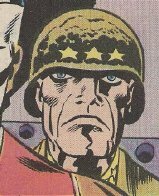 (Captain America I#196 (fb)) - Argyle Fist served in United States conflicts in Germany, Korea, and Viet Nam. (Captain America I#195) - General Argyle Fist, stationed at a base in the southwestern desert, was utilizing his men and resources to find several soldiers who had vanished. When Captain America and the Falcon also disappeared, he doubled his efforts, using a new sonar device called the "Hound Dog" to try and locate them. (Captain America I#196) - The Hound Dog proved unsuccessful at first, but Fist refused to quit that easily. When the Hound Dog disappeared as well, Fist ordered his men to move in on the search. They found the Hound Dog crashed and the pilot missing, and worked to find evidence in the wreckage. (Captain America I#197) - Fist ordered ships to scour the area in flames, and his efforts paid off when they discovered a series of caves that acted as the enemy's headquarters. The enemy (the Secret Empire) attacked, and Fist ordered his men and ordnance in to battle. Fighting against superior numbers and technology, such as the Empire's high frequency sound waves, Fist led his men forward. With Captain America and the Falcon battling on the inside, the Empire was quickly routed. Captain America told Fist about the Madbomb, a deadly device the Empire had developed, and they moved in to find it. (Captain America I#198) - While his men battled Empire operatives, Fist and the two heroes discovered that the Madbomb was missing. Fist radioed in to Washington and received orders to secure the Empire base. He passed along a lead about the Madbomb to Captain America and the Falcon. (Captain America I#224) - Fist assigned Captain America and Ken Astor to infiltrate a team of hijackers so that the Madbomb could be disassembled and moved successfully. When Captain America contacted Fist, Fist realized that the infiltration had failed and that the Madbomb was at risk to go off. Captain America stopped the Tarantula and Senor Suerte in time, and Fist arrived to clean up the mess. 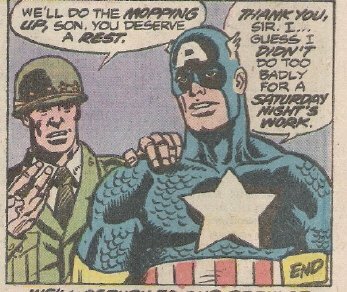 He commended Captain America on a job well done. Unfortunately, Ken Astor was killed in the line of duty. ((New) Defenders I#135 - BTS) - General Argyle Fist was contacted and asked to pick up the captured super-villain Manslaughter in Elijah, New Mexico. He turned him over to SHIELD for special holding facilities they had for metahumans. ((New) Defenders I#144) - Fist was contacted at his army base by Candy Southern and Dolly Donahue (with Sassafras) who begged for Fist to take his troops to Defenders Mansion and intervene in the skirmish they were having there against the Dragon of the Moon. Although Fist believed Candy , he didn't act until he heard reports of fiery pillars shooting up into space and damaging the atmosphere at that site. His troops arrived in helicopters, but the battle had already ended. ((New) Defenders I#145) - Fist's men took the wounded superheroes Angel and Cloud to the infirmary. Fist apologized to the heroes for missing the battle, but realized that he couldn't have done much in the battle and likely would have lost some men. After Fist confronted the Defenders about their recent battles against the Gamma Spores and the Dragon of the Moon, Iceman grew angry and compared Fist to Senator Robert Kelly, a mutant-hating politician. Fist grew angry right back, stating that Senator Kelly was just like William Taurey, a man Fist did not want to be compared to. Fist recommended that the Defenders get government clearance, and was shocked to learn that Candy Southern was now running the team. Meanwhile, John Blaze (the former Ghost Rider) and Roxanne Simpson had infiltrated the perimeter Fist's men had set around the Mansion. He ordered his men to attack the intruders until Iceman convinced Fist that Blaze was a friend. When the Valkyrie unexpectedly turned up alive, operatives Bob and Nancy Turpin fired at her until they learned who she was. ((New) Defenders I#146) - A few of Fist's operatives accidentally set off the Defenders' hologram security system. Later, Fist required the Defenders to vacate the property until things were cleaned up. He sent Specialist Turpin with them as a liaison. (Turpin later revealed herself as Soviet agent Seraph and helped the team on a mission before returning to the Soviet Union). ((New) Defenders I#150 (BTS)) - Two of Fist's operatives, Michael Kaye and Barry finished up their work at the Mansion and left. (Marvel: The Year in Review 1989 (BTS)) - General Fist was quoted in an article about Atlantis' attack on America, stating "The Atlanteans couldn't possibly take over the whole country, but they could very easily hold Manhattan and all its people hostage almost indefinitely. And then the government would be over the proverbial barrel. Attuma could make outrageous demands and threaten to wipe out hundreds, thousands, even millions of people until he got what he wanted. Shoot, I don't even want to think about what would have happened if he hadn't been stopped." Comments: Created by Jack Kirby and D. Bruce Berry. Don't feed candy bars to dogs. Chocolate can be toxic to dogs. or to anyone else not mentioned in this profile. (Captain America I#195) - The "Hound Dog" was the newest piece of ground-sonar equipment available to the United States military. It was able to rise on air jets and shoot out metal sensors, probing the ground with electronic impulses, which sent back echo images of what lay beneath the ground. It was utilized by General Argyle Fist in the Southwest as he searched for missing soldiers and superheroes. (Captain America I#196) - After probing for several hours, the Hound Dog finally found some results, but the craft was immediately attacked by the Secret Empire, and its pilot was taken hostage. The army found the craft wrecked. (Captain America I#224) - Ken Astor was an intelligence agent recruited by General Argyle Fist to infiltrate the hijacker team led by the Tarantula and Senor Suerte. Astor posed as Al Avision, and met up with a disguised Captain America at a party of Tony Stark's. They went undercover and overheard the Tarantula's plans to hijack the Madbomb before Suerte exposed Astor and Captain America as impostors. Captain America was poisoned and left for dead, while Astor was tortured for information and then killed. Captain America later defeated the villains. ((New) Defenders I#145) - Bob was one of Argyle Fist's men, occupying Defenders Mansion in the aftermath of their battle with the Dragon of the Moon. When the Valkyrie showed up unexpectedly, Bob and agent Nancy Turpin fired on her, but she deflected his bullets with a sword. ((New) Defenders I#150/2) - After finishing up mopping at Defenders Mansion, where they were stationed after the Defenders battled the Dragon of the Moon, Barry told Michael Kaye it was time to leave. Barry, though, wanted to stay and play with the Beast's hologram security system. They left Sassafras (Beast's dog, whom Michael would feed candy bars to) behind, and the hologram system on accidentally.